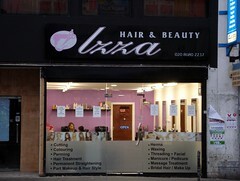 Hairdressers and beauty salon on North End, roughly opposite West Croydon Station. It opened some time in January/early February 2013. They offer various services including manicures, eyebrow threading, eyelash extensions, massage (including Indian head massage), and facials. According to a photo on Flickr, as of c. 1988 the premises (along with number 177 next door) were occupied by an opticians called Betterspecs. As of December 2011 the occupant of numbers 177-179 was a discount clothes shop called Oxygen photo; this closed some time around the start of August 2012, but another discount clothes shop called Clearance Outlet photo opened in the same space just a couple of weeks later, in mid-August 2012. By early 2013, Clearance Outlet had closed and building work was going on inside to transform half of the space into Izza. In October 2012, a planning application was granted for use of the premises as a restaurant/cafe. The design and access statement (PDF) submitted as part of the planning application stated that the actual occupant of the premises had not been decided, but the applicant was "in negotiations with a couple of well established fast food restaurants/takeaway franchises to sub let the unit". Nothing happened immediately in relation to this, but as of mid-February 2013 there was shopfitting work going on inside number 177, and in April 2013 it opened as Kaspas Desserts. Accessibility: A small step to get in. Last edited 2019-01-08 17:11:10 (version 46; diff). List all versions. Page last edited 2019-01-08 17:11:10 (version 46).